As it happens, dreaming up conspiracy theories is a minor amusement of mine. I find it livens up watching what passes for the TV news; and goodness knows, the world is rich in opportunities these days. 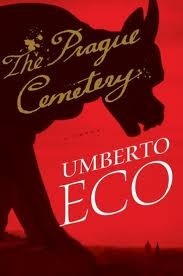 But Umberto Eco prefers to dabble in times past, setting that fabulously arcane Name of the Rose back in the Middle Ages, while The Prague Cemetery – shortlisted for this year’s Independent Foreign Fiction Prize – is set in the late 19th century. This precludes Moon Landing hoaxes, WikiLeaks and other favourites emanating from America, but it allows the author to mine the Dreyfus Affair and the Romanovs, not to mention Satanic rites, Freemasonry, the Knights Templar and the antiSemitic hoax ‘the Protocols of the Elders of Zion’. I’m not going to pretend that I understood The Prague Cemetery in its entirety. The whole point about arcane mysteries is that the reader is not supposed to. You are meant to be pleasurably mystified, and yes indeed I was. The only way to read books such as these, I’ve found, is to surrender to them, to read on and hope for the best. Trust the author’s cunning, and it will all make some kind of sense eventually. The story lures the reader into the grubby backstreets of 19th century Paris á la Victor Hugo where in a maze of derelict stairs, cluttered rooms and filthy passageways lurks a very nasty old Italian called Simone Simonini. The name is ironic: both Simone and ‘Little Simon’ mean ‘listening’ and derive from the Hebrew, meaning ‘he who hears the word of God’. Ostensibly a dealer in ‘second-hand’ goods, Simonini is actually complicit in almost every man-made calamity to befall Europe that you can think of. Yes, it is his mission-in-life to winkle out conspiracies of one sort or another, and to counter them with his own. In his armoury of weapons he has a very cunning and suspicious mind and the foulest set of prejudices you can imagine. He despises the French, the Germans, the British, and Sicilians. He hates Communists, the Jesuits, the Masons and the Jews. (I probably missed a couple). He vents these hatreds in his diaries where an unrelenting torrent of anti-Catholic, antiSemitic, and anti-Masonic diatribes will make most readers feel very uncomfortable indeed, even when they recognise that Eco is satirising extremists. For (even if you could be sure that the other diarists were not tampering with the ingredients list) Simonini is not to be trusted. His quest is to tidy up the world (as he knows it, in Italy and France) by despatching as many subjects of his venom as he can. His talent as a forger is discovered early on, and he puts it to good use. Before long, he comes to the attention of an assortment of Machiavellian agencies who engage him to assist with ‘information-gathering’ so that rival powers can be disposed of. His information is, of course, a tissue of lies, and is all the more effective for that. Nobody is actually interested in the truth, and the ease with which public opinion can be massaged is prescient. (It is within my adult life that the entry level of education for Australia’s Commonwealth Police was Year 8). The translation by Richard Dixon is excellent, and many thanks to him for enabling a most intriguing story. See a most erudite review at Open Monthly and for other reviews by the Shadow IFFP Jury click here – I love Stu’s characterisation of Simonini as a version of Sherlock Holmes’ arch-villain Professor Moriarty! You mean there was a conspiracy to invent him LOL? Thanks for this — I tend to read Eco a few years after publication and had not seen a blog review of this one. It does seem to fit the Eco pattern so I’ll look forward to it. I’ll be back in a few days (hopefully) to read the rest! I’m so looking forward to reading this, Lisa. It was an interview on the CBC with Eco himself that convinced me to try it. Hello Debbie, welcome to chatting about books at ANZ LitLovers! What an amazing man Eco is, multi-talented, and still putting out great books at his age. enjoyed this post, although have yet to read the book, as to Tony’s remark, Dan Brown started that rumour altho to be fair to him it was based on some arcane script found in a public toilet in Paris. Ps, have added all your posts pertaining to the list on my official Iffp list. Hilarious! Of course, Paris would have more intellectual public loo graffiti, eh? Have you checked that I have all of yours on my IFFP list? (http://wp.me/phTIP-451) Please drop a comment on it if I’ve missed any and I’ll fix it. I also read The DaVinci Code due to a recommendation from a family member who should know better – probably does now. I wasn’t all that tickled at first and later I got really angry because Brown implied in a really subtle way to less than savvy readers that this ugly hoax was indeed true. And I read “The Plot” by Will Eisner, a graphic non-fiction which included an introduction by Eco. Good book if you like graphic books – Will Eisner is a master! Hey, Bec, we could start a support group for people who’ve been persuaded to read the DVC by people who should know getter LOL! 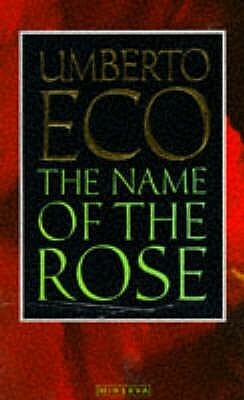 I’m starting to be not-so-sorry that I haven’t read the novels in between The Name of the Rose and this one!